Frances Arlene was born on Easter Sunday, April 16, 1922, in Westbrook, Maine to Danish immigrant parents, Edward (Ingvart), 36, and Anna, 32. She attended elementary, middle and high school in Westbrook where she excelled in her studies and in sports. She loved archery, horseback riding, softball and trips to the Maine coastline for clambakes. Arlene spent one year at Dana College in Blair, Nebraska, studying business administration and then returned to Westbrook to work in a bank. She met her husband Ronald Martin Jensen in Westbrook during World War II when he came to the East Coast to work in the Portland shipyard building liberty ships. They married on September 14, 1946. In 1948, they moved to Reserve, Montana with their daughter, Anne, where Ron was Lutheran Pastor. Their second daughter, Lois, was born and in 6 months they moved to Calendar, Iowa. Their third daughter, Kathleen, was born in Fort Dodge, IA. They made one more pastoral move to Eau Claire, WI where Arlene continued to be a dedicated mother and pastor’s spouse. Arlene spent 14 years supporting her daughters’ activities as well as contributing her talents to the congregations Ron was serving. Arlene returned to working outside of the home in 1962. Throughout her working career in various Midwest towns and cities, she was an adept office manager -- working the longest for the Detroit Stoker company and for Corporate Marketing in Chicago. Her grandchildren all had the opportunity at various times to visit her at her workplaces. She was an avid baker and all around excellent cook, and loved entertaining her Jensen and Rasmussen relatives. Arlene was a fabulous grandmother and enjoyed reading stories to her 5 grandchildren, pitching balls to them in the backyard, playing croquet, badminton, and horseshoes. She also loved playing cards and reading. Arlene played the piano and loved music and singing. She really enjoyed family sing-alongs with the Jensens and Rasmussens and attended a Messiah sing-along with Anne and Kathy in December before she died. She was very proud of all of her grandchildren. Arlene retired when she was 87 years old, and in 2011 she and Ronald moved to Madison, WI to be close to their daughter, Lois, and her family. Ronald died on September 9, 2013. In December 2015, Arlene moved to the San Francisco Bay Area, where she lived with her daughter and husband, Kathy and Randy Gee, and became a part of the Chapel community, and the Gee extended family. She is survived by Anne Jensen and her husband Henry Robinson of Palo Alto, CA, and their son Nicolas Robinson of Portland, OR; Lois and John Jacobsen and their sons Nathan and Daniel of Madison, WI; and, Kathy and Randy Gee and their daughter Emily, of Berkeley, CA, and their daughter Robyn and her husband Nathan Ilten-Gee of Vancouver, BC. 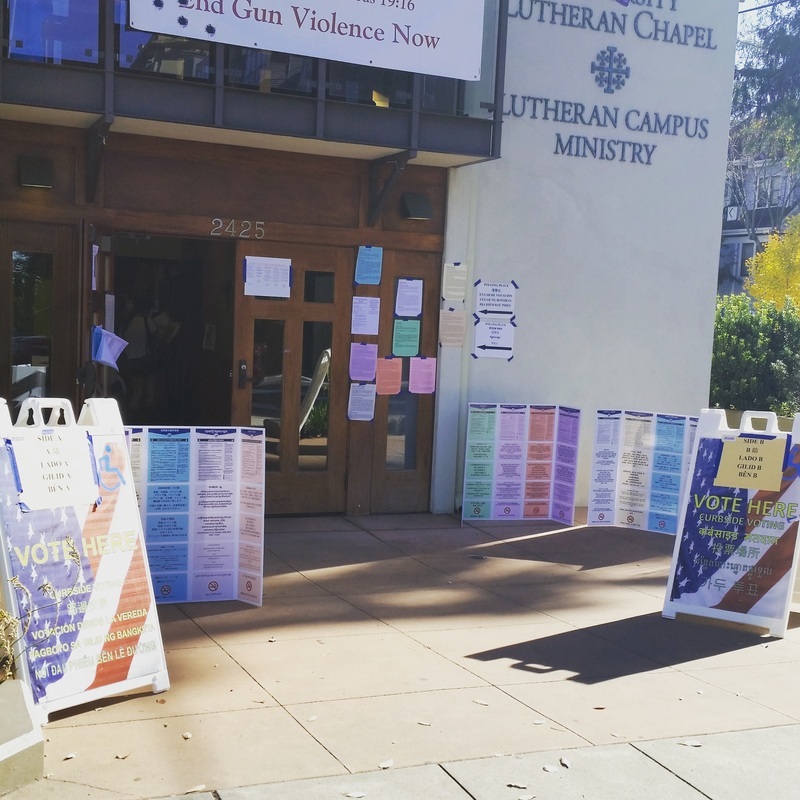 The Chapel is a polling place today, bustling with students, poll workers, and Berkeley residents. Make sure you vote! Here is the California Proposition Guide from the Lutheran Office of Public Policy. Check on your registration here. Keep up on your voting rights here. If anyone tries to stop you from voting, someone without an official poll worker ID persists in talking with you, or you otherwise feel weird about anything happening at your polling place, call 1-866-OurVote. Finally, how to vote as an act of prayer. On Sunday, we woke up to the unspeakable horror of the most devastating mass shooting in the history of our country. For the past day, I have sat silently with my husband at home, crying in the face of the impotence of a world that, despite our social progress, still hates us. In the midst of all this, I believe that Christian clergy in particular need to face an important reality: the church has blood on its hands. From our pulpits, and in our traditions, we have been complicit in fostering the sins of misogyny, sexism, racism, and homophobia. We are responsible for tolerating in our midst a poor, ignorant and murderous scriptural interpretation that leads to death and untold suffering. As a religious leader in the Boston-Metro Latino community, I cannot remain silent about this. Facing such a reality, I feel I must apologize for the complicity and silence of the Church. I am sorry for the pain our sinful indifference and self-righteousness has caused, and continues to cause, throughout the world. I dream of a day when being different is a reason to celebrate and not to fear. I hope for a day when all God’s children can come together without condemnation. I pray for a season where justice is not a matter of politics but of humanity. Padre Ángel D. Marerro is pastor of Santuario Luterano in Waltham, MA. Originally posted in the Huffington Post. 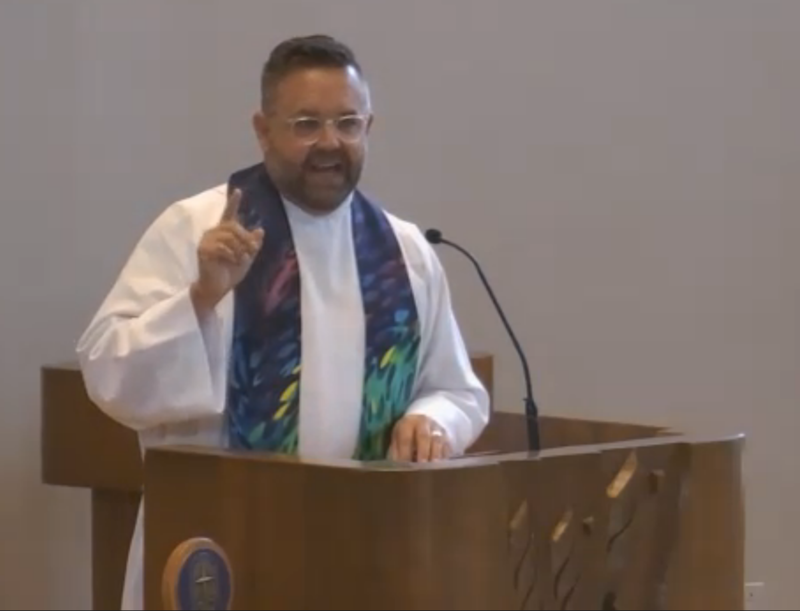 Orlando: A Pastoral Response from a Gay Latino Priest. Please bear with us while we get acquainted with our new layout. Have questions? Email Logan.